Closing in on one million subscribers is BookBub, an e-mail newsletter operated out of Cambridge. It's essentially a "daily deals" e-mail for avid readers, offering free or discounted downloads of what co-founder Josh Schanker calls "acclaimed books" in digital form. 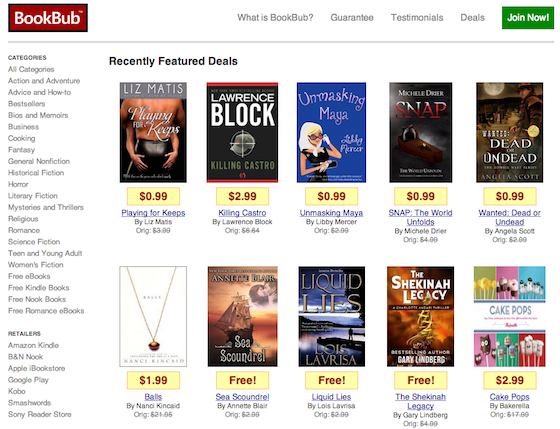 And BookBub was only founded in January of last year. Schanker says got the idea for BookBub from talking to a friend, Jennifer 8. Lee, who had started an e-book publishing company. "It seemed like publishers were looking for ways to build awareness for their titles and authors, and they wanted to spend money doing that, but no one was there to take their money," he says. Readers sign up for the free BookBub newsletter, and specify the genres they're interested in. Each day, they get an e-mail touting three to five free or discounted e-books. Publishers and independent authors pay to be listed in the newsletter, though Schanker says there is some curation: "Everything that we feature is fundamentally an ad, but we reject more than half of the submissions sent to us." He says five of the largest book publishers are customers, along with "hundreds of independent authors." Why do authors or publishers pay money to promote e-books they're giving away for free? "At the very basic level," Schanker explains, "it may be to get more exposure for themselves as an author, for the publisher, or maybe for a book series. Everyone is trying to build up an audience base." The company has six employees in Kendall Square, but Schanker says they're about to post another another five or six job listings. Schanker previously started and sold two other local companies: Sombasa Media (acquired by About.com) and Sconex (acquired by Alloy Marketing & Media.). He and BookBub co-founder Nicholas Ciarelli have been bootstrapping the company so far, without outside funding.